Exhaust and Supply Fans → Roof Exhaust Fans → Canarm Ltd. brand Model SDUB Direct Drive Centrifugal Up Blast Roof or Sidewall Mount Exhaust Fan Restaurant & Gen. Applic. CFM Range: 340-3,100 @ 1/2" S.P. 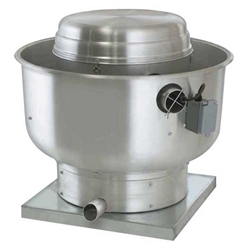 Canarm Ltd. brand Model SDUB Direct Drive Centrifugal Up Blast Roof or Sidewall Mount Exhaust Fan Restaurant & Gen. Applic. CFM Range: 340-3,100 @ 1/2" S.P. Can be used for roof or wall mount applications (all units). Variable speed motor control (single phase only - VFD’s required for 3 phase). 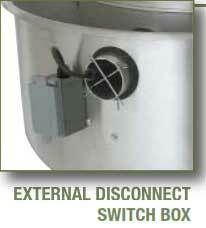 External disconnect switch - standard. ETL listed for compliance with UL 705 & UL 762 standards. 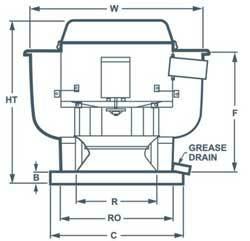 **Please Note: Model #SDUB-10 Is Not Suitable for Restaurant Use.